Boracay, the most visited place and popular tourist spot of Paradise Philippines, with it's powdery white sand bragging right as one of the best beaches in the world. Everybody thinks it's expensive but there are cheaper alternatives to cheap Boracay package tours peddled almost everywhere and that is the DIY tour of the famous island. Touristy resorts include AltaVista, Asya, Discovery Shores, Friday’s, Mandala Spa Resort, Nami Private Villas, Punta Rosa Boutique Hotel, Bella Vista de Boracay and Red Coconut. Many restaurants, turo-turo and street food on the beach. Boracay Visitor Center (+63.2.890.8902; website) can provide more information. Tourist Center at Station 2. Boracay's sand does not feel hot to the feet even on a hot summer day. It has something to do with the absence (or is it presence) of a certain compound in the sand. History of Boracay narrates how European backpackers "discovered" the beach and released photos of the place to the world. Allied Bank, Metrobank, BPI, Landbank (ATM Fees and charges for BancNet, Megalink, ExpressNet, Visa, Plus, Cirrus, Maestro, Mastercard, JCB, China Union Pay apply.) There's a BPI ATM in front of Boracay Beach Chalets in Station 2. From Caticlan Airport, you need to ride a tricycle to get to Caticlan jetty port then a banca/fastcraft to Cagban Jetty Port (about 15 minutes travel time) on Boracay Island then another tricycle to your beach resort or accommodations. 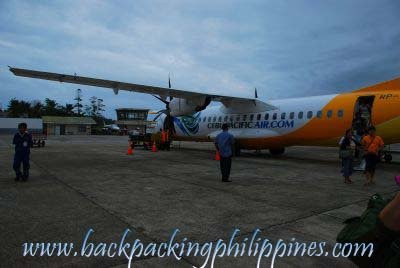 First you book a flight to Kalibo Airport then take a bus or van (right outside Kalibo Airport). Additional 1.5 hours travel time plus PhP200.00 bus fare but significant savings in airfare via Kalibo. with no stop-over in Cebu or Manila. Tutubi boarded an overnight ferry to Kalibo with a college friend to take part in the Ati-atihan Festival in 2004. No updated information though on ferries plying this route. SuperFerry and Negros Navigation don't list Kalibo on their destinations list, the closest port is Iloilo. Cebu Ferries don't have trips even to Iloilo pier. It's 2 hour bus ride to Batangas port plus 3 hours RORO to Calapan, Mindoro plus another 3 hour land travel to the port of Roxas, Mindoro then a 5 hour RORO to Caticlan port. They only ply the route Manila to Roxas with daily trips to Roxas at 8pm (fare: PhP700.00) from their terminal on southbound Espana corner Antipolo (near the PNR Espana station) in Sampaloc, Manila. From Roxas City, you need to ride another van to Caticlan. Buses From Iloilo to Caticlan are serviced by GM Liner and Ceres Liner. 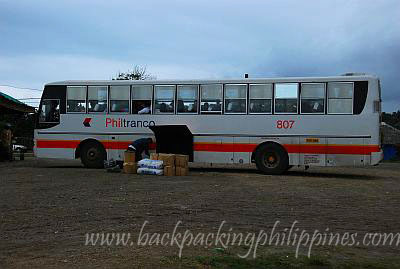 Take the Bacolod to Iloilo ferry (Oceanjet, Weesam Express et al) then ride the bus to Caticlan from Iloilo. Book a flight to Cebu to Tacloban then a connecting flight to Caticlan or Kalibo. Fares and fees varies, sometimes you can haggle with tricycle drivers for cheap rates. Some resorts offer free wi-fi Internet access, some charge extra. best to bring SmartBro or Globe Tatoo broadband Internet. it's usually the airlines and boracay resorts' policies if you can bring your pet dog, cat or other pets that you have to the island. Motorcycles, cars and private vehicles RORO to Boracay? nice blog ;) very informative! thanks! Last April I paid $150 round trip on SeaAir. The various airport fee's, taxes, trikes, etc. came up to around 500P. I stayed at two different hotels. One a small distant for the beach (Alice in Wonderland) and then a small hut very close to the beach (Villa De Oro). Both were perfectly acceptable for me. However, I'm a person that doesn't need room service or even hot water, lol. The first place I was charged about $35 a night and the second place I was charged $50 a night. There are off season specials like crazy. You can also look for out for very special airfares and save quite a bit from what I've heard. I'm also of the belief that it's always better to do a DYI instead of a package deal. anonymous, yeah, backpacking is also DIY tours like what i did the last time i was there. do you know how much exactly will it cost if its from manila to boracay using roro? as in all the fees and taxes and buses and ships thanks..
hi, i been scrolling to your post and they are great infos worth sharing.i been searching ways to have an affordable vacation in boracay with my fam but i find it too expensive. Do you think July would be good to stay there? Hi. Im planning on going to boracay and am looking for cheaper accommodation than US$12 a night. US$12 was the cheapest i found and it had a TV??? all i need is a fan... a mozi-net i got. I managed for cheaper in the caribbean. Bali has cheaper options as well but there we went off-tourist-routes. i want to go kiting there for January and February 2009 - wondering whether local cheap one-month rentals are available. the number for MBRS shipping lines seems not to be correct - tried so many times! does anyone now how I can book a ferry ticket from Manila to Caticlan in advance? Thanks for your response.Sorry late to revisit. we were thinking on july kasi at least we could stay longer.it's kids' vacation. Anonymous 2, MBRS Lines stopped servicing the Manila to Caticlan ferry route a few months back. i will update this post later. why not try the Ro-ro bus to Boracay? mostly,how much is the cheapest get away package going to boracay?? I will be in Boracay on May30-31 with two others , can you help me find cheapest accommodation? Can you also give bus schedule to Manila? superb! I've read a lot of your very informative blogs. I want to recommend Polillo Islands in Quezon. I'm willing to accompany and guide you. are you interested in trailbiking. Polillo offers a great challenge to an adventurous guy like you. just email me at wildcock_888@yahoo.com. more power and God bless you! Hello. I would like to ask if you have any idea of how much environmental fee should be paid on Caticlan port. I was gonna answering Anonymous but I realized you already did. Sometimes people are just too interested on what they want to know that they often fail to notice the whole package like your whole post that you're trying to give them the most information possible. Well done on such a detailed post on DIY travel to Boracay. Even if you speak Akeanon but if they see that you're a foreigner, they'd still charge you with the environmental fee. I have friends who ask my address in New Buswang (Kalibo, Aklan) and they use it to get away with the enviro fee, it works because they sound and look local, haha. Does anyone know when was the first hotel or guesthouse or resort established in Boracay? As this is about budget travel, you can easily walk from Caticlan airport to the port. It takes about 5 minutes. Basically you turn left when you reach the road outside the airport, following the traffic. After 200 metres you hit a main road. Go straight across, and start looking for the ferry port on your right. I do it as a matter of principle in fact, as the fare is a rip off. Wow this is awesome, nice blog and informative. I hope you can post some photos here. Thanks for the listings, it is helpful. Hope you can post some photos here. so much useful.....especially for tourists..keep up it!..more info,more tourist. The island paradise known as Boracay is the Philippines’ worst kept secret. Arguably the best white sand beach the world over, there’s no shortage of things to do here. Whether you take a stroll barefoot on the sand, go snorkeling, shopping, diving, reef walking or simply sit back and watch the sunset, you’ll quickly find out why Boracay is paradise on earth. papunta aku dun tutubi sana ay magamit ko ang iyong mga napakagandang suhistyon.maraming salamat. Hello! I just want to ask and I hope you could help. Is there 24 hours public transportation available in Kalibo? We plan to book for an overnight stay in Kalibo since our flight is 5:30am (and must be in Kalibo Airport 2 hours earlier around 3am). Can we easily find transportation that early? Thank you. 'Thank you for this blog. That's all I can say. You most definitely have made this blog into something thats eye opening and important. 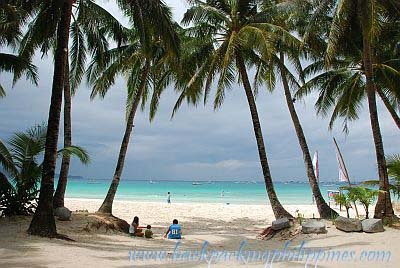 With this informative blog you've made I know a lot of people now are thinking to visit Boracay. I hope I can also do visit the place. Thank you. hi! i would like to ask the most updated prices for tricycle fees and other fees such as the above posts..pls..we'll be in boracay this january 12-15...thanks for the very informative posts.